UMAP is an association of government and non-government representatives of the higher education sector in Asia and the Pacific. The organization is responsible for enhancing cooperation among higher education institutions in the region and increasing mobility of students and staff through exchange programs. The UMAP Constitution is a set of fundamental principles and the embodiment of the governing authority of UMAP. The UMAP Board has sole authority to amend the UMAP Constitution. 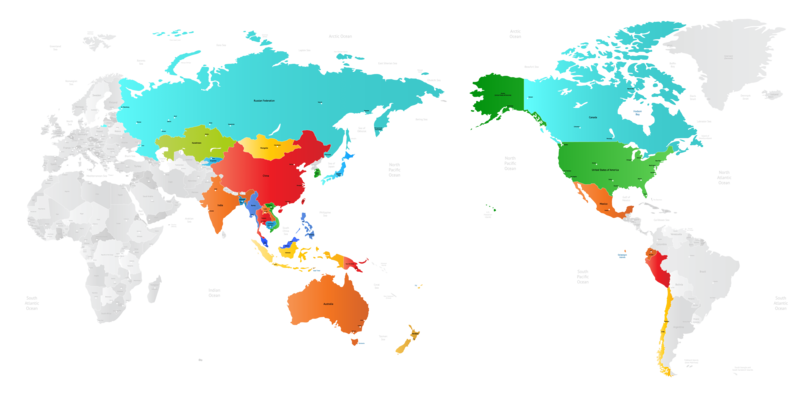 Australia, Bangladesh, Brunei, Cambodia, Canada, Chile, People’s Republic of China, Ecuador, Fiji, Guam, Hong Kong, India, Indonesia, Japan, Kazakhstan, Republic of Korea, Kyrgyz, Laos, Macao, Malaysia, Mexico, Mongolia, Myanmar, New Zealand, Papua New Guinea, Peru, Philippines, Reunion Island, Russia, Samoa, Singapore, Taiwan, Thailand, Timor-Leste, USA, Vietnam. Others may be added as eligible Member countries/territories by a majority vote of the UMAP Board. Full Members are those eligible countries/territories that have paid the annual UMAP membership fee. Full Members are expected to participate in the UMAP Board and UMAP Committee Meetings, and they are entitled to participate in the UMAP Exchange Program. Associate Members are those eligible countries/territories that do not pay the annual UMAP membership fee. Associate Members may attend the UMAP Board Meetings and UMAP Committee Meetings only as observers and cannot participate in UMAP Exchange Programs. Members are required to be represented by their respective governments’ higher education departments or ministries, individual universities, university umbrella organizations, or a combination of these. Each Member County/Territory shall set up a Member Secretariat (National Secretariat) to be the chief point of contact in that country/territory. Individuals are not eligible for membership. The UMAP Board is the governing authority of UMAP and is composed of representatives from each of the Full Members of UMAP. The Board shall select the UMAP International Secretariat Host Country/Territory from proposals made by interested Full Members and shall elect a UMAP Chair from Full Members. The elected UMAP Chair shall nominate a Chairperson and inform the UMAP International Secretariat. UMAP Board Meetings shall be held at least twice a year, once in the country/territory of the UMAP Chair and, in principal, once in the country/territory of the UMAP International Secretariat. A quorum of at least 50 percent of Full Members is necessary for the Board to vote on decisions. Each Full Member shall have one vote. In the event of a failure to achieve consensus on an item at a Board Meeting, a simple majority vote of the Full Members present shall determine the issue. UMAP IS shall be responsible for the management and administration of the day-to-day operations of UMAP and serve as the liaison with National Secretariats. The Member Country/Territory serving as International Secretariat shall be selected by the Board. The term of International Secretariat shall be 5 years. The costs of providing the basic infrastructure for the International Secretariat shall be borne by the Full Member Country/Territory serving as the International Secretariat and shall not be represented in the UMAP budget. The Member Country/Territory serving as the International Secretariat shall appoint a Secretary-General to the International Secretariat. Each UMAP Member Country/Territory needs to establish a UMAP National Secretariat (NS), which represents the country/territory and is responsible for the promotion and development of UMAP Exchange Programs. Ideally NS should be a governmental institution of higher education (i.e. Ministry of Education) or work closely with such a governmental organization. In some Member Countries/Territories, a particular University/Institution serves as UMAP NS. 1) Payment of membership fee and (if necessary) collection of participation fee from Member Universities/ Institutions in the country/territory. 2) Provide a list of Member Universities/Institutions and contacts. 3) Promote student exchange programs in the country/territory. 4) Promote and oversee Member Universities/Institutions in the country/territory. 5) Disseminate information and news from UMAP IS in the country/territory. 6) Attend and vote at the UMAP Board Meetings. 7) Report annually regarding the situation of student mobility in the country/territory and UMAP activity there. An administrative region within the countries/territories listed in Attachment 3 of the UMAP Constitution may represent the region and set up a Sub-National Secretariat only when there is no representation for the whole country/territory. Even in a case where there is more than one Sub-National Secretariat within a Full Member Country/Territory, the country/territory has only one vote in a Board Meeting. The UMAP Board shall set up special committees as deemed appropriate. No special committee may exercise any authority other than that specifically outlined in the establishing resolution. The members of the Committees are nominated by the UMAP Board. Pledge of Agreement is a simplified name for the Student Exchange Agreement. The formal name is “The Pledge of Agreement on UMAP Multilateral Student Exchange Program between University and UMAP International Secretariat”. The agreement operates between participating higher education institutions (consortiums of institutions) on the basis of mutual acceptance of the appropriateness of national accreditation determinations, and under the mutual understanding of contents of “The Pledge of Agreement”. A Member University/Institution is an individual university/institution that is located in a UMAP Member Country/Territory and registered as a UMAP Member by the UMAP NS of that country/territory. Each UMAP NS is responsible for confirming whether new members from their respective country/territory can join the UMAP network on the condition that they are officially accredited. A Pledged University/Institution is an individual university/institution that has signed the “Pledge of Agreement”. Only Pledged Universities/Institutions of Full Member Countries/Territories are able to participate in UMAP Exchange Programs. An Affiliated University/Institution is an individual university/institution that is located in a Full Member Country/Territory and registered as a UMAP Member by that country/territory’s National Secretariat but hasn’t signed the Pledge of Agreement. By signing the Pledge of Agreement, each Affiliated University/Institution is eligible to participate in UMAP Exchange Programs as Pledged University/Institution. An Associate University/Institution is an individual university/institution that is located in Associate Member Country/Territory. A Participating University/Institution is an individual university/institution that has agreed to accept exchange students from other Participating Universities/Institutions by submitting the “Outline of Proposal” for UMAP Exchange Programs in a certain term/semester to UMAP IS. Participating Universities/Institutions may send their exchange students to other Participating Universities/Institutions. An Active University/Institution is an individual university/institution that has been a Participating University/Institution at least once during the most recent five years. UMAP currently offers 4 programs to undergraduate and postgraduate students. They are the UMAP Multilateral Program, UMAP Bilateral Program, Super-Short Term Program (SSTP) and UMAP Summer Program. Outline of Proposal is the name of the format which is utilized by Participating Universities/Institutions to offer and explain their programs for exchange students. By submitting an Outline of Proposal to UMAP IS, the university/institution agrees to participate in UMAP Exchange Programs for a certain period of time. They are then able to accept eligible exchange students from other Participating University/Institution if there are applicants who meet the requirements of the university/institution. The university/institution is also eligible to send their students to other Participating University/Institution once they submit the proposal. The UMAP Multilateral Exchange Program is also called Program A and/or UME. It is a multilateral exchange program among universities/institutions that have signed the “Pledge of Agreement”. In principle, Participating Universities/Institutions send and receive two students per semester on a tuition-waived basis. Students can choose to study either one or two semesters when they apply for programs. UME runs twice a year. One begins in autumn (July to September) and the other begins in spring (January to April). Each program has two application cycles in these periods, during which Pledged Universities/Institutions can participate based on their preferable timeline(s). Therefore UMAP accepts applications of exchange students 4 times per year. The UMAP Bilateral Exchange Program is also called Program B and/or UBE. It is a bilateral student exchange made between any two UMAP Participating Universities/Institutions that would like to exchange more students than agreed under UMAP Multilateral Exchange Program, or launch special programs between them. The term and condition including tuition waiver/non-waiver need to be discussed and agreed between both parties, and the additional MoU (Memorandum of Understanding) can be signed the universities/institutions if necessary. If a Host University/Institution accepts a student nominated by UMAP IS for Program B with tuition waived, the host is also able to treat the student as a participant in Program A and count the result toward the Quota for Outbound Exchange Students. The Super-Short Term Program is also called Program C and/or SSTP. It is a short-term (one to eight-week long) program offered by UMAP Participating Universities/Institutions that signed the “Pledge of Agreement”. The study period of SSTP is generally between June and December, and the programs are available in a wide range of disciplines: cultural studies, language proficiency courses, vocational training, entrepreneurship, and more. Universities/institutions offering SSTP may charge or waive tuition fees for students coming from UMAP Member Universities/Institutions in other countries/territories. Universities/Institutions can decide whether they give academic credits to their offered programs or not, but are encouraged to prepare certificates indicating the number of UCTS (normally 1 credit equal to 1 UCTS) with program schedules that show participants’ workload inside/outside the classrooms. Unlike Program A or B, students of Pledged Universities/Institutions other than Participating Universities/Institutions are able to apply for the program. UMAP Summer Program is a special summer program provided by UMAP. The Venue and content of the program differ every year depending on the organizer of the program. It started in 2016 as “UMAP Discovery Camp 2016 (UDC2016)” hosted by the Commission on Higher Education of the Philippines in partnership with De La Salle University, Lyceum of the Philippines University-Bantagas and Ateneo de Manila University. In 2017, UMAP Summer Program was held in Japan, co-hosted by UMAP Japan National Committee, Niigata University, and Toyo University. Discovery Camp 2018 in Thailand was organized in Bangkok, Thailand, by the Office of Higher Education Commission and three co-host universities, namely, Chulalongkorn University (CU), King Mongkout’s University of Technology Thonburi (KMUTT) and Bangkok University (BU), during July 22 – August 4, 2018. Eligibility to apply for this program is generally limited to Pledged Universities/Institutions; however, the National Secretariat of the host country/territory has the discretion to modify its eligibility requirements and the selection of participants among applicants. The UMAP Program Year is based on UMAP Multilateral and Bilateral Exchange Program application cycles and doesn’t necessarily follow a calendar year or academic years of Participating Universities/Institutions. UMAP Program Year will be named based on students’ study period. For example, UMAP Program year 2019 consists of Program A&B 2019-2 (Multilateral Exchange for 2020 Spring Semester). Those constitute one year as UMAP offers programs two times per year. Until 2017, UMAP provided participants of Program C (Super Short-Term Programs) with SSTP scholarship of up to US$800 per student. The scholarship was discontinued in 2018. The scholarship will be restarted in 2019 for limited number of students, changing the amount of the scholarship to $500 per student. According to the amendment of “Pledge of Agreement”, the UMAP Board decided to introduce the following rule regarding UMAP Multilateral Program: Universities/Institutions that accept more than 2 exchange students in a given semester on tuition-waived basis (Program A) will be allocated an equal number of additional quotas for outbound exchange students. The quota can be used from the following semester without an expiration date. As stated in the “UMAP Multilateral Exchange Program” section, UMAP offers two programs per year depending on the start of the study period. Each program has two application cycles so that Universities/Institutions may choose one or both cycles depending on their internal schedule of accepting exchange students. This is to adjust the difference in academic year by country/territory and to provide students with more opportunity to study abroad. UMAP IS will announce Timelines of each programs at the start of program period. Timeline is time frame and deadlines for programs registration and announcement, student application and placement (acceptance or refusal of applicants) etc. These coordinators are persons who coordinate applications and the acceptance of exchange students in both Home and Host Universities/Institutions. They act as representatives of each university/institution for UMAP Exchange Programs and sometimes connect and coordinate between students and faculty of their study. USCO System is the acronym for UMAP Student Connection Online, which will be developed and instituted in 2018. Utilizing the system, students and UMAP coordinators of Participating Universities/Institutions will be able to apply through this system, and Host Universities’/Institutions’ Coordinators are able to monitor students’ application status and to approve or decline their applications. USCO also offers statistical data. UCTS was developed to simplify the process of transferring credits earned in overseas exchange programs to the students’ Home Universities/Institutions. UCTS uses the 60 credit point scale originally developed for the European Credit Transfer Scheme (ECTS). These points can be applied to both trimester-based and semester-based academic years. The UCTS credit point scale facilitates the conversion of credits between different grading systems. It is not intended to supplant the existing credit point scales (or other measures of student workload) used by the Host and Home Universities/Institutions, nor is it meant to replace their regulations and autonomy in terms of assessing students’ learning outcomes. You can read the detail of UCTS on our website (http://umap.org/ucts/). UMAP Student Exchange Application Forms are used for students who apply to UMAP Exchange Programs. These forms can be used both for incoming and outgoing students. Students are required to fill out items in the form and submit them to their Home University/Institution Coordinators, who connect nominated students to UMAP IS. After the introduction of USCO System mentioned above, student applications are performed through USCO System. Students as well as each university/institution are encouraged to use this form when they submit their study plan to their Host University/Institution after their acceptance. The template in the USCO System can be downloaded for accepted students. You are able to see the form included in UCTS Users’ Guide on our website.(http://umap.org/ucts/). URN promotes the mobility of academic faculty, researchers and students through the establishment of research networks. This consists of groups of 2 or more researchers from UMAP Pledged Institutions who share common research interests. URN calls for proposals from research networks. All submitted proposals will be reviewed by an international panel of reviewers, and UMAP will select the proposals based on their significance, timelines, and relevance to the goals of UMAP. Selected research projects will be funded by UMAP and the selection of projects will be performed biannually. Only Pledged Universities/Institutions of Full Member Country/Territory are eligible to apply for URN. The UMAP International Conference is a conference and/or symposium which should be held for the general aim of UMAP. Based on the UMAP Constitution, the Chairperson of UMAP Board has to convene and preside over it and at least once during the term of Chairmanship. Recently UMAP International Conference has been held successively with the UMAP Board Meeting.